Carnegie Knox is delighted to have raised £1000 for their chosen charity, Sue Ryder, towards their brick by brick campaign. 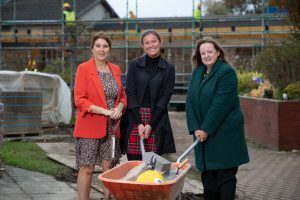 The money is being used by the charity to support their Dee View Appeal that will create a further 20 bedrooms at their Aberdeen-based neurological care centre. Sue Ryder is a charity that supports people through the most difficult times of their lives, giving compassionate, expert care to those who most need it. Home to Scotland’s only purpose-built specialist neurological care centre, the charity provides person-centred hospice care for those facing a frightening, life-changing diagnosis. Sue Ryder treats more conditions than any other UK charity in their hospices, neurological care centres and in the community while also encouraging others to improve the lives of people living with such illnesses.